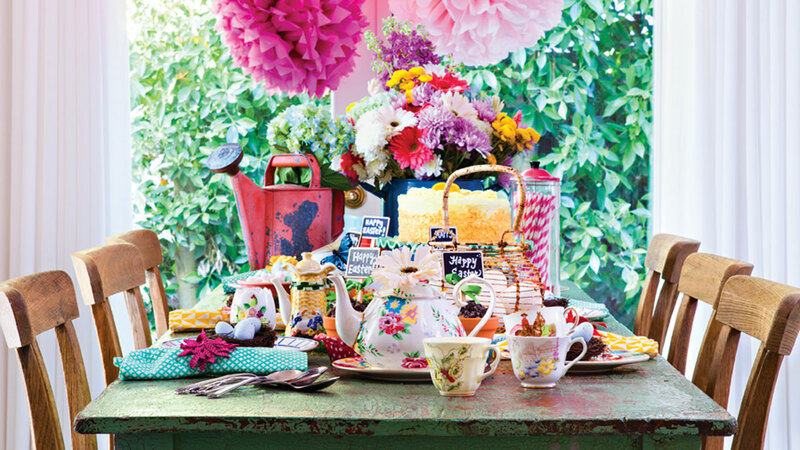 Create the perfect garden-themed tea party full of color and flea-market finds. 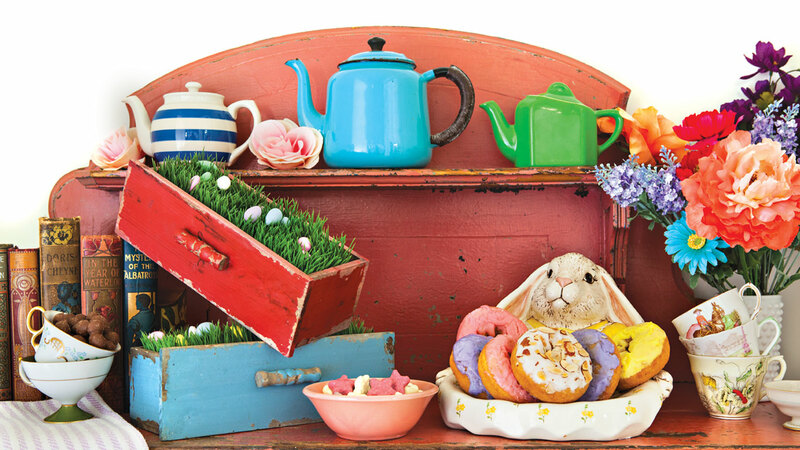 Welcome spring in style with an Easter-themed tea party full of vintage treats for the senses. With the help of garden-themed and floral accents, you can recreate the look in your own home for a party and depending on your colors, patterns and mix of old and new, this party can be sophisticated and vintage chic, or colorful and creative for kids of all ages. We created this get together in interior designer Alison Kandler’s dining room; her pastel-green checked floors and iconographic floral wallpaper inspired a country-chic approach. Everything used on the table is bold and vibrant to make a seasonal statement. From the mix-and-match napkins and china to hanging tissue paper pom-poms, keep your party brightly colored to reflect the diversity of a garden. 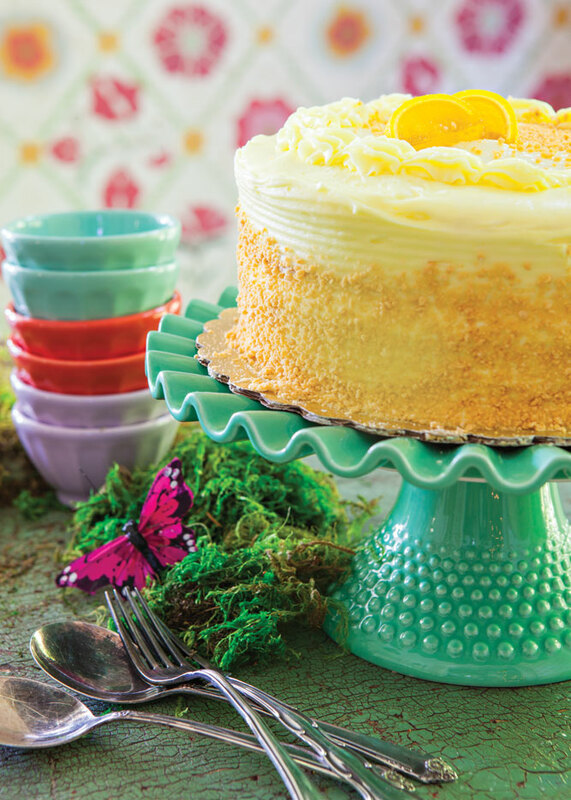 It wouldn’t be Easter without an egg hunt; bring the hunt to your plates by using faux bird’s nests and porcelain eggs as embellishments. Add a quick name tag and they easily become place cards. Look for other ways to customize treats for each guest. Mini terracotta pots are easily upcycled into cupcake servers. 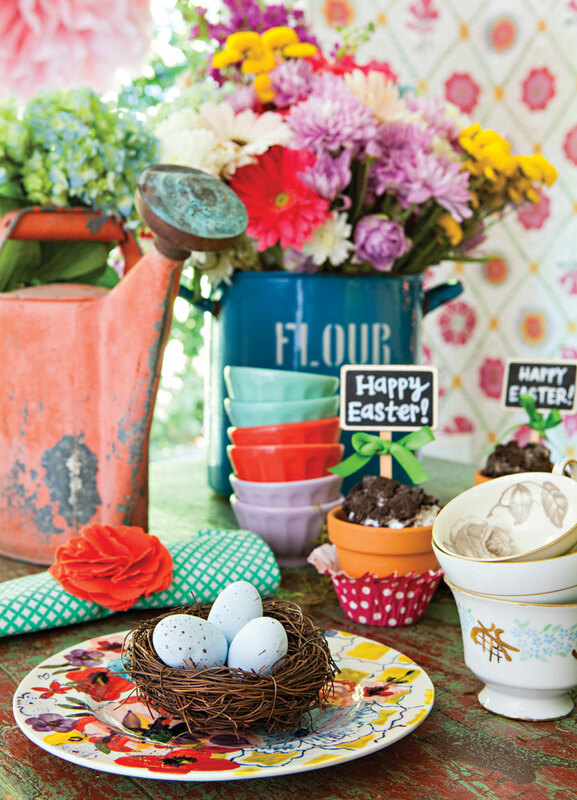 You can top off the look with a garden stake hand-lettered with an Easter greeting. For your centerpiece, reuse garden staples as containers for your flowers. Here, an old watering can and a vintage pot stand in as colorful, textural vases. We also took vintage crates and repurposed them to display treats in a fun way by filling them with faux grass and candy eggs. Stack teacups filled with more treats for added height. The key here is to use vintage finds you already own in new ways to add whimsy to your table setting. Also, keep your decorations bright, bold and floral themed. Teacups with floral patterns allow guests to sip their drinks in style, and lots of flowers placed around the table make it feel like you’re relaxing in the garden. Decorate your table with a sprinkling of craft moss and butterflies to create a cozy and softer down-to-earth feel. And don’t overlook your vertical space. 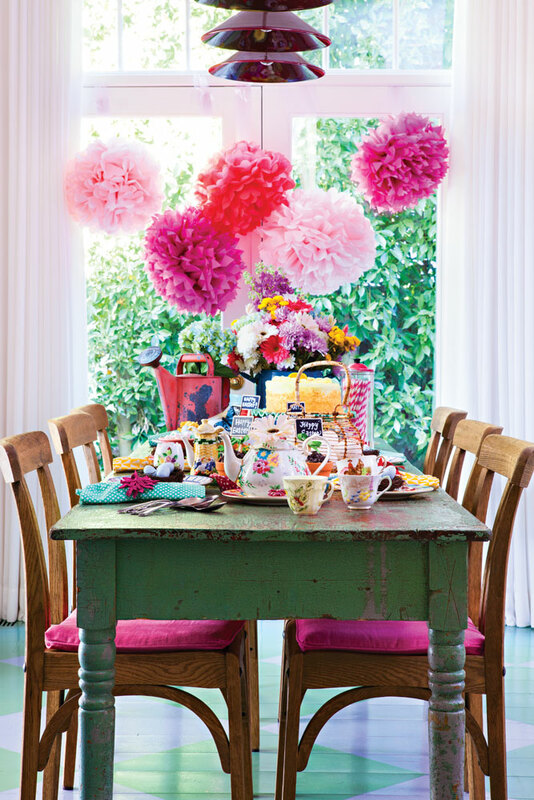 Hanging tissue-paper pom-poms above the table makes for a colorful and eye-catching display. You can use rainbow colors or light and dark shades of one color. Last but not least layer your table with more small nods to spring and add even more interest. Fabric flowers make great easy embellishments for napkins rings. One of our favorite touches were the small faux bird’s nests with pastel porcelain eggs that makes the table look sweet and fresh from the garden.